For the first time in this column, I’m going to write about a brew that I came up with that I might not ever build. Most of the time I don’t bother writing about a decklist unless it’s something that I have already built or something that I’m looking forward to building and have some of the pieces for. As I’ve written about in the past, I’m attempting to not only create decklists that are differing color schemes, but I’m trying to build at least one deck of each archetype. There are a bunch of different archetypes depending on who you ask, but some of the main ones are Aggro, Mid Range, Control, Combo Group Hug, and Chaos. I have a few aggro decks, most of them having tribal sub-themes. I’d say some of my decks fall under the mid range theme, but I wouldn’t label any of them as such. I have several decks that rely on combos to win. 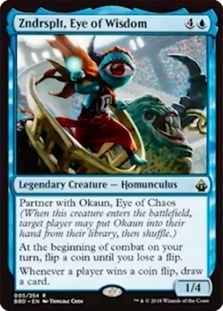 I’m building an Azorius control deck with Stax and Tax themes, have a group hug deck under construction, and now I’d like to talk about this current brew, which is a chaos deck. Bear with me, there is a lot to take in here. You can read the individual cards for descriptions as to what they do, and in some cases you can reap plenty of benefits if you’re lucky enough to win some of your coin flips — but the real value here is having one or both of your commanders on the field so that you can reap additional benefits from them as well. Some cards will force your opponents to flip coins, and those wins will also help you out. 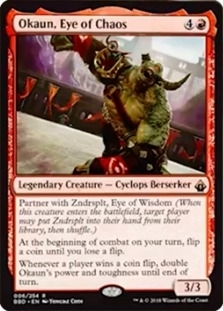 Ideally, you’ll get your commanders out onto the board and then start playing some of these spells or creatures and utilize their coin flipping to buff up Okaun and draw more cards with Zndrsplit. I won’t go into specifics because for the most part these cards are being used for two purposes — value off of your commanders, and to create chaos in the game. One card I would like to highlight though is Chance Encounter. This enchantment is one of our alternate wincons; it states that for each time you flip a coin you put a luck counter on the enchantment. Get 10 of those counters and during your next upkeep you win the game. Hopefully you’re causing enough chaos that it slips by your opponents! This is the part of the deck that isn’t reliant on coin flips, rather the part that aims to create chaos. From stealing opponents stuff, to taking extra turns, to copying spells or warping permanents into something else, these cards should help to create a chaotic board state and keep your opponents on their toes. No two games of EDH are ever alike, but this should make it to where no one can predict any sort of outcome whatsoever. That’s all I have to share for now. I’m still unsure if I’ll ever actually build this deck but it was fun to brew and I’m sure it would provide a different EDH experience from the norm.